Siam Bayshore Resort and Spa is situated in Pattaya's Chonburi province and overlooks the sparkling waters of the Golf of Thailand. The hotel has a direct backdoor entry to Walking Street and is a huge resort with forest theme.Popular attractionssuch as the Ripley's Believe It or Not Museum, Pattaya Floating Market are within 15 minutes' drive from here. The vibrant Mike Shopping Mall, Bali Hai Plaza and Central Festival Pattaya Beach are within 10 minutes' drive of the property. Guests can reach here in around 45 minutes' drive from Utapao-Rayong-Pataya International Airport. Pamper the mind and body with a complete range of massages and beauty treatments offered at the resort's Lotus Spa. Other wellness and leisure facilities available here include a fitness centre, hot tub, kids' playground, along with six tennis courts and two outdoor pools. Additionally, an indoor pool tableand complimentary Wi-Fi access are provided for guests. The property maintains 280 thoughtfully designed rooms and suites that offer splendid pool and gulf views. All guest rooms are appointed with air conditioning, flat-screen TV, CD player, mini bar, refrigerator and free Wi-Fi access. Relish grilled seafood, meats and mouth-watering international delicacies at the resort's Seafood BBQ Buffet Restaurant. Guests can relax with a glass of chilled beer in the cosy setting of Explorer Bar. Those fond of vegetarian Indian dishes can visit Saras Restaurant, whereas kebabs, tikkas and chicken curries can be enjoyed at Ali Baba Tandoori and Curry Restaurant, both within 10 minutes' drive from the property. Indian restaurants that are a short 10-minute walk away from the hotel include Haveli, Red Chilies, Indian Rasoi and more.McDonald's Restaurant is just 7 minutes' drive away. Enjoy a spectacular cabaret performance at the well-known Tiffany's Show, only 10 minutes' drive from the resort. Deal Applied: MMTOFFM8A. You Get Flat INR 1414.0 OFF! Deal Applied: MMTOFFM8A. You Get Flat INR 1616.0 OFF! Deal Applied: MMTOFFM8A. You Get Flat INR 1793.0 OFF! Deal Applied: MMTOFFM8A. You Get Flat INR 1844.0 OFF! Deal Applied: MMTOFFM8A. You Get Flat INR 3789.0 OFF! The drainage canal passes through the hotel and hence the outdoors gets very uncomfortable. Apart from that rest all okay and Worth. I stayed with my family. Location is good and you can find lots of restaurants nearby hotel especially Indian restaurants for this reason I booked hotel. Great stay, great food. Beautiful spacious rooms. Will be there soon. It was good stay with courteous staff. They need to add some charging point. Food overpriced but good! Breakfast spread was elaborate and nice. Staff could have been a tad courteous. The only exception was Ms. Nok who helped in organizing various trips around Pattaya. Resort with good ambiance but the management can still do better. Buffet breakfast was good, location was near the walking street which gets very crowded in the evenings like a fish market. Resort full of greenery, having a private beach. Go green initiatives, clean room, friendly staff. Overall great experience. U have to stay there to experience the hospitality. Highly recommended. Very beautiful and the staff was good. The property was very beautiful and was Worth a stay! It is right on the walking street. What better can you get? Location is near the market. Food was good in taste. Little expensive. But vegetarian options available. Room location was nice. Mine was pool view. Pool is nice and Long. View of pool is amazing. Perfect location for access to Raas, Nasha, and other good Indian clubs. Best location on walking street and the only 5 star. Paradise in Pattaya. Very close to walking street. Polite and great staff. Spacious rooms with good options in breakfast. Great travel guide. Overall peaceful and value for money experience. Will visit again. The stay was very pleasant. The staff was very helpful. And their buffet breakfast was simply amazing. The location is very nice as you can See the Sea from the hotel. Everything was great from welcome to checkout. Hotel location is very good. Breakfast excellent and the staff courteous. They help beyond their responsibility have stayed twice. Choose your room for ocean front. Awesome location, good and clean room with enough space for leisure. Perfect fit being amidst the core of the town. The hotel is advertised as a 5 star resort and the booking was also very expensive. However the room was just about the equivalent of a three star. The bathroom fittings, size of the bathroom, cleanliness and the quality of facilities in the bedroom were pretty depressing. Really spoil the vacation mood when we saw the room on checking in. The breakfast and the restaurant were however pretty good. Would not go to this resort again. Not value for money. Very costly as last minute booking. Heavily overcharged. Some rooms facing is not liked it.
" Welcome World Beach Resort and Spa Pattaya is located in the vicinity of the Jomtien Beach in the Chonburi Province of Thailand. Excellent facilities and services. The location is nearby walking street and is far away from the entrance of the city. The are near it is very crowded with tuk-tuks and cars in the morning and afternoon. Beach is nearby and has good options for food, both veg and non-veg. Swimming pool is awesome and is the best for all age groups. It offers Taxi service but better to book it from outside as it would be cheaper. Beach is located nearby. The rooms are bit inside from the main gate and the area is bit lonely but there's nothing to fear about. The rooms are very clean and the bathrooms are also well equipped. It's perfect to live here. The Siam Bay shore has very warm friendly staff who are more than happy to go out of their way to help you and make you feel comfortable. Rooms are good and very comfortable. The property is slush green patch right in the heart of the city. You are walking distance from the "walking street", the beach and all major shopping areas. It's absolutely value for money. They even have an in house spa. The only hitch sometimes is the language issue as all the staff are not very fluent with English but their smiles make up for that I had an absolutely amazing vacation. The front Desk are very rude. They are not co-operative at all. I have been allotted two separate beds room. Assured us will change room at the time of check in, In the evening when I enquired started saying that we have not stated in your document that we will provide you single bed room. Secondly from commode excess water flown in bath room, asked them to change room, did not agree only bath room cleaned. And in spite personally went to front desk requested for cleaning the entire room, did not clean. The senior lady of the front desk is very rude. We were 2 couples who stayed a Siam Bayshore Pattaya & it proved out to be a best decision to choose this Siam Bayshore Resort Pattaya for our weekend getaway. The Siam Bayshore Resort Pattaya's location is great, very near to nice restaurants, tourist spots. Breakfast was good & overall services were satisfactory. Our Room was nice & bathrooms were clean. Will give the Siam Bayshore Resort Pattaya & rooms a 4. 5 Star rating. 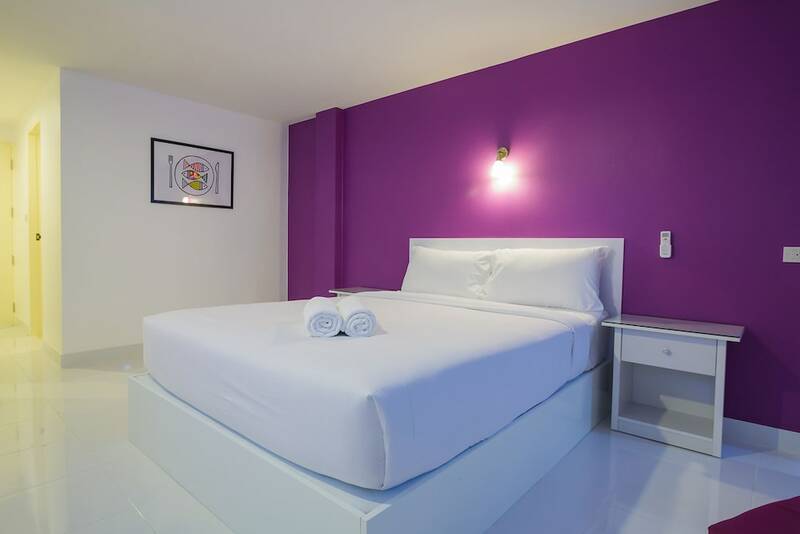 Though the resort is situated in the crowded city of Pattaya, the location is excellent. The ambience and facilities of the resort are world class. The facilities include swimming pool, gym, tennis, etc. To mention a few. Commuting to different attractions in the city is also very easy. Breakfastspread is also very good, though I feel that a little more Indian cuisines can be included. Excellent Siam Bayshore Resort Pattaya at an excellent location. Very good cleanliness at a competent price. Challenge is the service. Many nos on phone directory don't respond. They don't know from where to get the water to serve to the guests and so on. I was quite impressed to see the neatness and the environment in the Siam Bayshore Resort Pattaya. Pool is very nice and clean. This is great Siam Bayshore Resort Pattaya. You will not find a better resort in Pattaya than this. There are so many activities around. Classic Restaurants with delicious food. This Resort is near to Walking Street. The whole experience of Siam Bayshore Resort is amazing. It starts from the drive to the resort, the welcome at the reception & the check-in process. All smooth. The best of all in its price range. Very prime located at the end of walking street. Accessible by both roads - walking street and Pattaya road. Good facilities. Excellent swimming pool with slide. No idea about food as we did not had here. Taxi service and other tour operations was also too good, the lady in taxi service helped us. Room design and location was fantastic. Great location to walking street and value for money. But the tropical deluxe rooms are facing a drain and when I sought for a room change, they say that they were completely booked. Also some of the staff seemed pretty impolite at breakfast as if doing a favour. I stayed there for over 3 days and yet the attitude of staff not so good. Their concierge is very nice. Very large property with a lot of greenery and near to beach. Best for peace lovers. Restaurants good. Nice breakfast. Rooms were neat and clean. In regard to service a lot can be improved. Value for money. Stayed with my family at Siam Bayshore Resort for two nights and very good property. Value for money ideal for family with children. The staff were very friendly and helpful. The support from travel desk was very special. Would recommend this property. Not to much for Indian food. Excellent location. Just walking to street and beach as well shopping places. Hotel is very well matinee with lush green gardens as a very cool space to live it nothing less then a resort. A good resort Siam Bayshore Resort Pattaya. Many attractions are nearby. The breakfast buffet is elaborate with Continental, Japanese and Thai food choices. The dinner option is very good too. Great to be with kids! Right near the pier. Good to take boats to nearby islands. Clean rooms! Excellent fresh breakfast !! We had a great stay. The SPA has great set-up with good treatments. Nice layout overall. Had a wonderful experience in the resort. The location is perfect, near the market and next to walking street .. Nicely done rooms, Good spread in breakfast, helpful staff They even arrange for a baby sitter for your child if required. Highly recommended ..
Stay was quite good. Food was awesome. Lovely staff and was friendly. Well located area from where we can visit easily to all places. This resort is Perfect for all travellers. Situated at the heart of the city, one end on the market and other on the walking street and beach road. All amenities and food including breakfast were just top class .. Good place for family, couples or solo travellers. Every one have to visit one time in this property beautiful Siam Bayshore Resort Pattaya super cool location good environment staff is also so helpful sea view room and very near to walking street fun and enjoyment my personal advice to everyone must visit one time. Very friendly staff and a lovely location. Always helpful and the coffee in the restaurant is amazing. The curio shop has amazing bargains too. Stayed as part of a group and enjoyed every moment. The travel desk lady is excellent. Always helpful and very friendly. It was one of the best stay of my life .. Excellent location, clean rooms, good food, best services, big swimming pool. In house spa .. Big ground area to play .. Tennis ground .. Gym .. Very near to all discotheques .. Very good property situated bang on walking street also can go coral Island from nearby Bali hai pier, lots of restaurant and clubs near by, only minus point is sewer line passing in between Siam Bayshore Resort Pattaya... If that can be solved it will become best Siam Bayshore Resort Pattaya of Pattaya. Had no complaints. Superb location on walking street. They apparently charge a joiner fee. Breakfasts was decent. The tropical deluxe room was just awesome. Distance from reception to the room is far. Very beautiful resort with lots of greenery, making it a natural looking atmosphere. Nice staff and good room service. Wonderful pool with slides. Located just walking distance to the main pier of the city and on the other side road starts to the walking street area. Comfortable rooms with beach view make it a complete stay. Exceptional! Everything was fantastic except for a lack of clarity for baggage allowance. The rooms were great, the Siam Bayshore Resort Pattayas were superb beyond expectations! I was a single female traveller and felt completely safe and pampered. Strongly recommend the to Siam Bayshore Resort Pattayas I stayed in. Location is good, Hotel is beautiful and pool is fantastic, Hotel services are very fast, rooms is very big, Hotel private beach is very beautiful, in breakfast good food many dishes is available there.